Hop aboard my Smart car taxi! If you're in San Francisco, let me give you a ride. 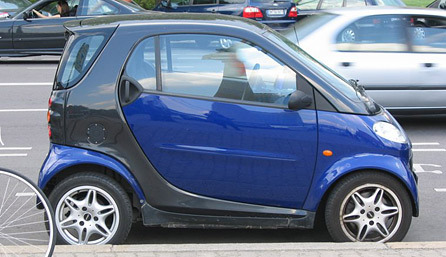 The people at Smart just brought over a slick new tiny car for me to test-drive for the week. I aim to put the thing through its paces, gauging its gas mileage and its ability to squeeze into tight parking spots. For this, I'm going to drive around San Francisco quite a bit. But driving around pointlessly seems a bit immoral these days. How to get around this? I'm going to give you a ride! Here's the plan: You, faithful reader, live in San Francisco and intend to get from Point A to Point B sometime this week (from now to June 17). Good news, I'm here to take you where you like. Some rules: These trips must be arranged in advance. I won't schedule any trips before 2 p.m. or after 8 p.m. And you've got to be alone, because the Smart car seats just two. In addition, you've got to agree to a short interview about what you think of the car, and you should be OK with your name and photo appearing in print and/or on video. And one more stipulation: When we arrive at your destination, you've got to stay in the car until I find a parking spot nearby. Ease of parking is an essential part of this review, so I've got to squeeze in parking jobs wherever I can. It'd be a plus, in fact, if you wanted to go to a neighborhood with particularly bad parking. If all those rules work out for you, e-mail me at machinist@salon.com, subject line "Smart car taxi!" and let's ride. Update: Sorry, all slots are booked!